After concerns about the safety of Black athletes in Nazi Germany were put to rest by the International Olympic Committee, most African American newspapers opposed a boycott of the 1936 Olympics. Black journalists often underscored the hypocrisy of pro-boycotters who did not first address the problem of discrimination against Black athletes in the United States. Writers for such papers as The Philadelphia Tribune and The Chicago Defender argued that athletic victories by Blacks would undermine Nazi racial views of "Aryan" supremacy and foster a new sense of Black pride at home. In the end, 18 African Americans -- 16 men and 2 women -- went to Berlin, triple the number who had competed for the United States in the 1932 Los Angeles Games. All of these athletes came from predominantly white universities. This demonstrated to many Black journalists the inferiority of training equipment and facilities at black colleges where the vast majority of African-American students were educated in the 1930s. 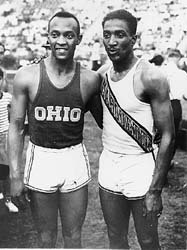 The Chicago Defender of December 14, 1935, reported that African American track stars Jesse Owens, Eulace Peacock, and Ralph Metcalfe favored participating in the upcoming Olympics because they felt that their victories would serve to repudiate Nazi racial theories. Peacock was injured in trials held in July 1936 and was never able to compete in the Olympics. In 1935 the Defender's circulation was larger than that of any other African American newspaper. June 1936. 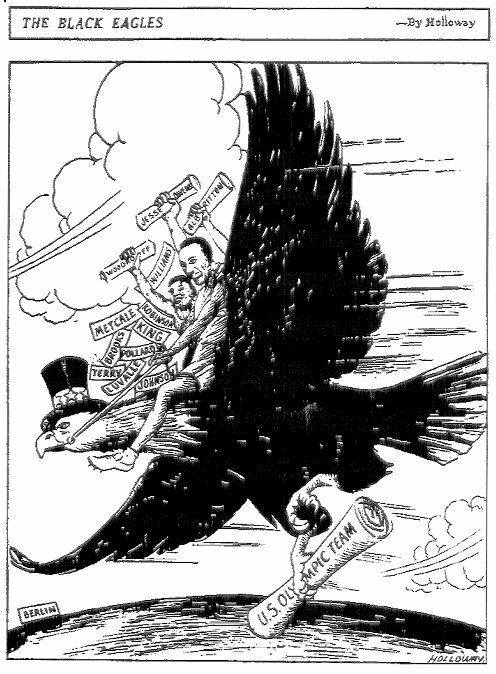 This illustration is titled “The Black Eagles,” by artist “Holloway” from the African American newspaper The Pittsburgh Courier. It provided a rousing send-off for Black Olympians who sailed with the rest of their team for Germany. The eagle, destined for Berlin, carries a scroll titled “U.S. Olympic Team.” The other labels contain the names of African-American athletes. July 11, 1936.